Philippe Boucher has worked full time at Microsoft Corp. for three years, reviewing the content of mobile apps in his native French and other languages. But Boucher is actually employed by Lionbridge of Waltham, a provider of business services, including translation, and considered a temporary worker without the health, vacation, and sick time benefits offered to regular Microsoft employees. Last year, Boucher and some of his 40-odd Lionbridge labmates on Microsoft’s Redmond, Wash., campus did something about it. They organized a union, authorized by a National Labor Relations Board vote last fall, and began bargaining with Lionbridge for benefits. The action of Boucher and his co-workers, who call themselves “permatemps,” illustrate the concerns of a growing legion of contract workers. There are 2.8 million temp workers in the United States, the highest number ever, according to the National Employment Law Project, a workers rights group in New York. The sector is projected to soon become the fastest-growing industry in the country. Many of those workers are immigrants working blue-collar cleaning and warehouse jobs. But there is also a growing number of people filling contract jobs fueled by technology, such as Uber drivers, who are connected to their employers through mobile apps. The rise in outsourcing is changing the nature of employment, creating a layer of contractors and franchisees between employees and companies. The trend offers employers greater efficiency and flexibility, labor analysts say, but often means lower wages and fewer benefits for workers. Hourly wages for the median worker in the staffing industry are 22 percent lower than those earned by all private-sector workers, according to the National Employment Law Project. The growth of temporary jobs can also create a system of second-class workers. Boucher, the Lionbridge employee at Microsoft, said he and his fellow longtime temp workers wear orange badges, while everybody else has blue-colored identification tags. Microsoft employees get paid days off on holidays such as the Fourth of July, Thanksgiving Day, and Christmas Day, but Lionbridge employees are forced to take the days without pay, Boucher said. When those Lionbridge employees become sick or want to take a vacation, their paychecks are docked accordingly. 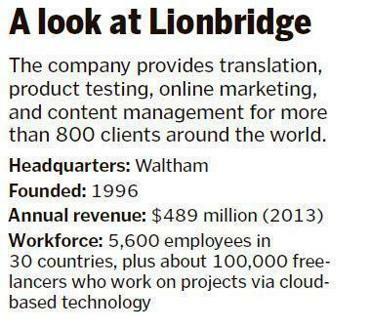 Lionbridge has 5,600 mostly full-time employees in 30 countries, as well as a network of 100,000 freelancers around the globe who test search engines, translate websites, and perform other cloud-based services in more than 300 languages. Different classifications of employees are eligible for a variety of benefit packages, the company said, and all US workers have access to benefits such as mandated medical insurance and 401(k) retirement plans. Most Lionbridge employees are permanent, but some, like Boucher and a majority of his colleagues, are temporary workers hired for a specific time frame. The company would not disclose the length of its Microsoft contract. Some of Lionbridge’s employees in Europe are covered by work councils, which meet with management on behalf of workers. But the Microsoft group — since relocated to Bellevue — is believed to be the first to form its own union. Microsoft has run into issues with its temporary workforce in the past. In 1996, a federal appeals court found some of the company’s independent contractors were entitled to employee benefits such as 401(k) and stock plans. Microsoft declined to comment on the union of Lionbridge workers. The approximately 40 Lionbridge employees in Boucher’s lab at Microsoft come from about 20 countries, Boucher said, and their international roots may have made them more inclined to stand up for their rights. Unions and paid vacation time for all workers are the norm in many other countries, he noted. Boucher, who has written multiple blog posts and a 149-page e-book about his fight, is not sure if other temporary employees will follow the lead. But as their numbers grow, he is hopeful they will earn more rights. “The idea was to show to people what can be done,” he said.